Our websites are not intended for children and we do not knowingly collect data relating to children. If you are below 16 you must stop using our websites unless you have our express written consent to use it. The Lion Containers Group is made up of different legal entities, details of which can be found here. This privacy notice is issued on behalf of the Lion Containers Group so when we mention “Lion Containers”, “we”, “us” or “our” in this privacy notice, we are referring to the relevant company in the Lion Containers Group responsible for processing your data. Lion Containers Limited is the controller and responsible for our websites listed here. This version was last updated on 19/04/18 and historic versions (if any) can be obtained by contacting us. (c) search information providers, some of whom are based outside the EEA. Identity, Contact and Transaction Data from third party goods & services providers engaged by us or you and with whom we interact as part of our own contractual scope of work. 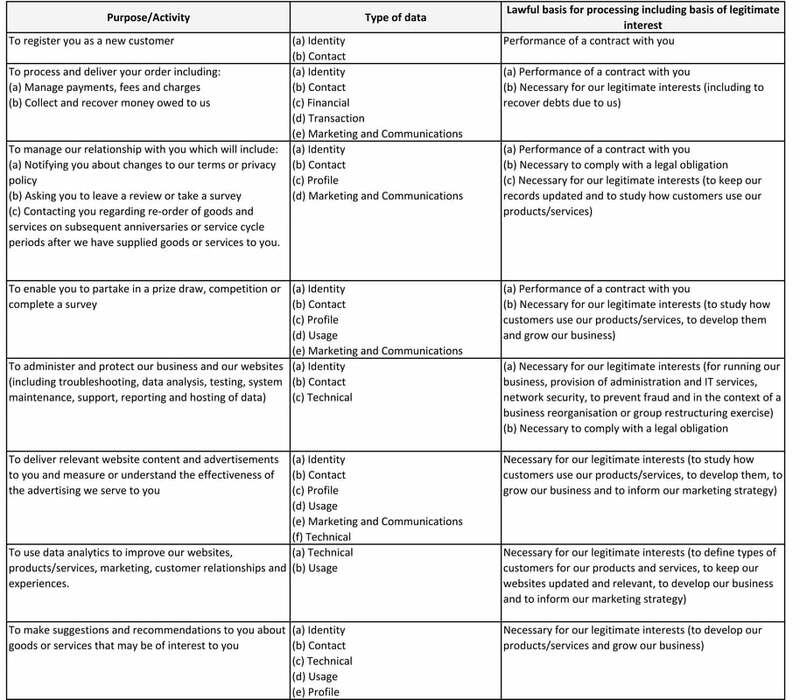 We have set out below, in a table format, a description of all the ways we plan (or may in the future plan) to use your personal data, and which of the legal bases we rely on to do so. We have also identified what our legitimate interests are where appropriate. You can ask us to stop (and to ask third parties to whom we have provided your personal data to stop) sending you marketing messages by contacting us at any time. To the extent reasonably necessary, where you instruct us to provide goods and services in collaboration with (including where such collaboration is limited to coordinating timescales or equivalent interaction) with your other providers of goods and services based (in whole or in part) outside the EEA. Internal Third Parties means members of the Lion Containers Group. Service providers based both within and outside the EEA who provide IT and system administration services. Suppliers of goods (including components) and services comprising part of our provision to you, including without limitation delivery contractors, based both within and outside the EEA.